WELCOME TO GOOD HARBOR BEACH! A surprise meeting with a beautiful female Ruby-throated Hummingbird. She is drinking nectar from the wildflower Saponaria officinalis. The plant’s many common names include Soapwort, Bouncing-bet, and Wild Sweet William. The name Soapwort stems from its old fashioned use in soap making. The leaves contain saponin, which was used to make a mild liquid soap, gentle enough for washing fine textiles. Saponaria blooms during the summertime. Although introduced from Eurasia, you can find this wildflower growing in every state of the continental US. The hummingbird in the clip is a female. She lacks the brilliant red-feathered throat patch, or gorget, of the male. Ruby-throated Hummingbirds are all around us, you just have to know what to plant to bring them to your garden. Mostly they eat tiny insects but if you plant their favorite nectar-providing plants, they will come! 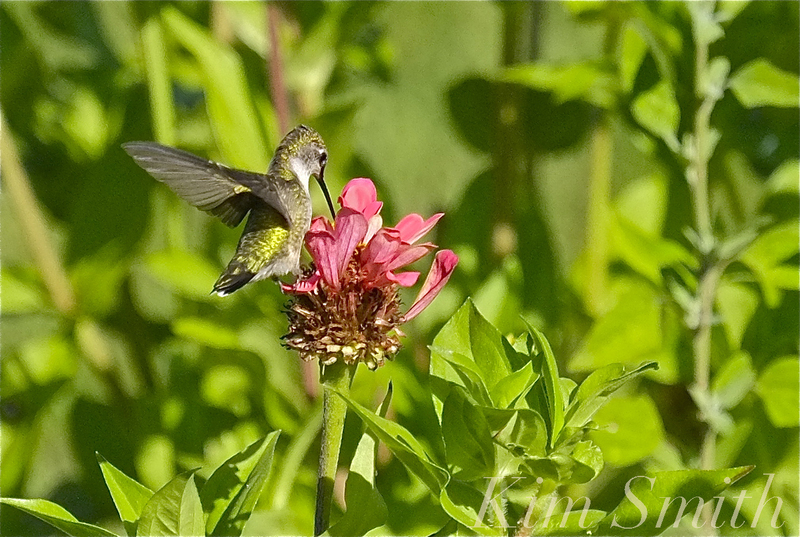 Female Ruby-throated Hummingbird drinking nectar from zinnia florets. This entry was posted in Birds, Birds of New England, Cape Ann Wildlife, Gloucester, Ruby-throated Hummingbird, Wildflowers and tagged Beautiful Birds of Cape Ann, Bouncing-bet, Dropmore Scarlet, female Ruby-throated Hummingbird, Good Harbor Beach, Japanese honeysuckle, John Clayton, Lonicera sempervirens, Lonicera sempervirens’ Dropmore Scarlet’, Major Wheeler, Native Honeysuckle, Native Plants, Ruby-throated hummingbird, Saponaria officinalis, Soapwort, Wild Sweet William, Wildflowers, Zinnia elegans on July 27, 2018 by Kim Smith. Hummingbirds can easily distinguish red contrasted against green. Early blooms are an important feature for the vine planted to lure hummingbirds. You want to provide tubular-shaped flowers in shades of red and orange and have your hummingbird feeders hung and ready for the earliest of the northward-migrating scouts. If nothing is available, they will pass by your garden and none will take residence. Hummingbirds can easily distinguish red contrasted against green. We go so far as to plant vivid Red Riding Hood tulips beneath our hummingbird feeders, which hang from the bows of the flowering fruit trees. Although hummingbirds do not nectar from the tulips, the color red draws them into the garden and the flowering fruit trees and sugar water provide sustenance for travel-weary migrants. 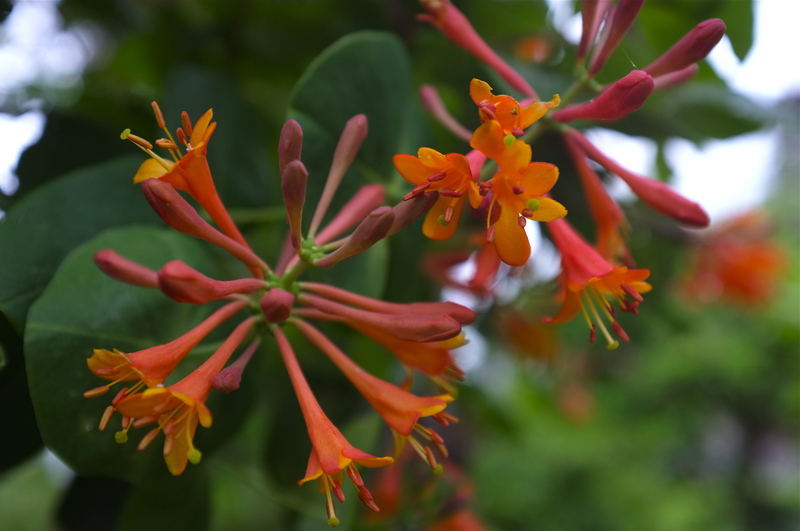 Lonicera sempervirens, also called Trumpet and Coral Honeysuckle, is a twining or trailing woody vine native to New England. Trumpet Honeysuckle is not at all fussy about soil and is drought tolerant. Plant in full sun to part shade. 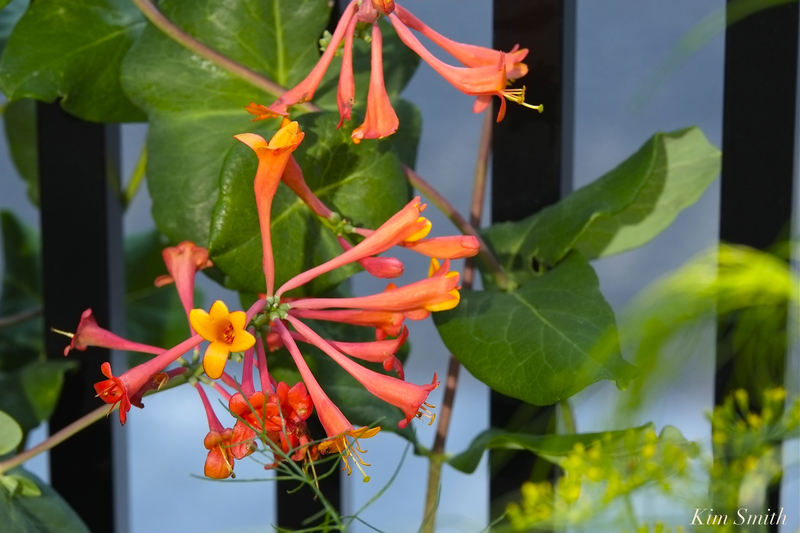 If Trumpet Honeysuckle becomes large and ungainly, prune hard to the ground—it grows rapidly and a vigorous pruning will only encourage more flowers. 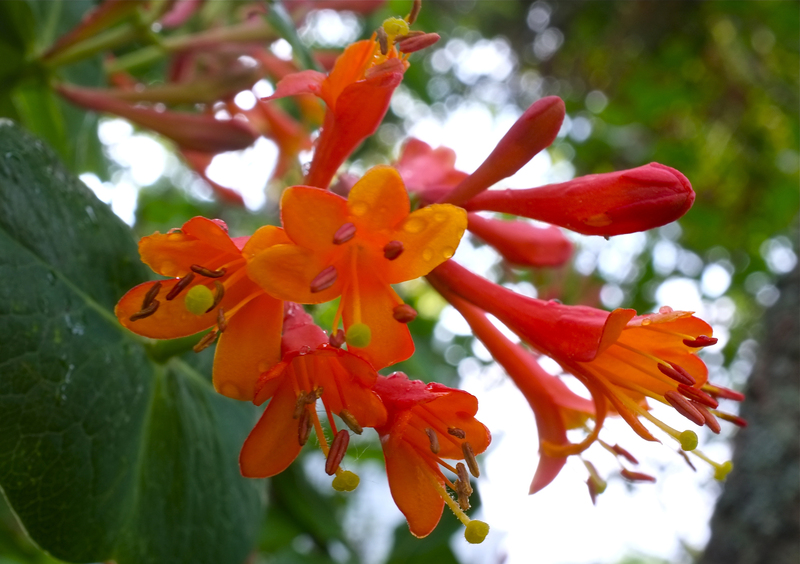 ‘Major Wheeler’ flowers in a deeper red than that of the carmine of ‘Dropmore Scarlet.’ ‘John Clayton’ is a cheery, cadmium yellow, a naturally occurring variant of Lonicera sempervirens, and was originally discovered growing wild in Virginia. The blossoms of ‘Mandarin’ are a lovely shade of Spanish orange. Trumpet Honeysuckle has myriad uses in the landscape. Cultivate to create vertical layers, in a small garden especially. 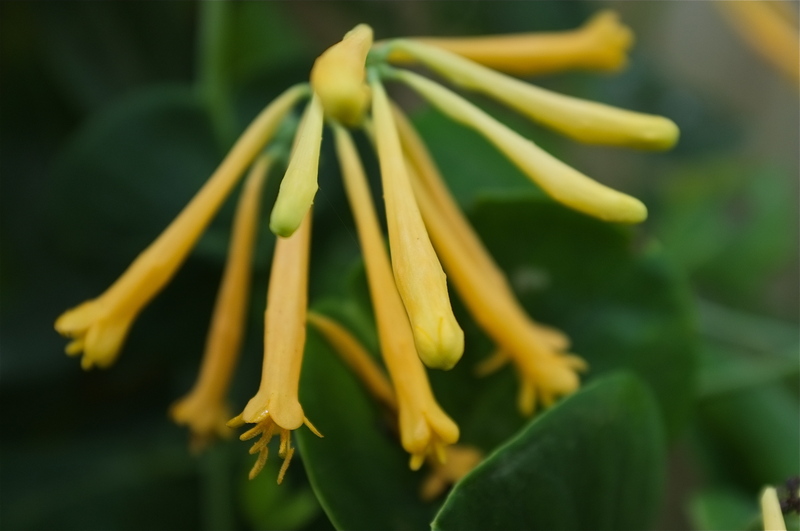 Plant Lonicera sempervirens to cover an arbor, alongside a porch pillar or to weave through trelliage. Allow it clamber over an eyesore or down an embankment. Plant at least one near the primary paths of the garden so that you can enjoy the hummingbirds that are drawn to the nectar-rich blossoms. I practically bump into the hummingbirds as they are making their daily rounds through the garden flora. Did you know they make a funny squeaky sound? I began to take notice of their presence in our garden, when at my office desk one afternoon in late summer, with windows open wide, I heard very faint, mouse-like squeaks. I glanced up from my work, fully expecting to see a mouse, and was instead delighted to discover a female Ruby-throat outside my office window, nectaring at the vines. Trumpet Honeysuckle not only provides nectar for the hummingbirds, it also offers shelter and succulent berries for a host of birds. While planting the summer gardens at Willowdale this past week we observed dozens of Ruby-throated Hummingbirds nectaring at the Trumpet Honeysuckle embowering the courtyard doors. Lonicera sempervirens is a caterpillar food plant for the Snowberry Clearwing moth. This entry was posted in Antennae for Design, Creating a Butterfly Garden, Fujifilm x100, Home and Garden, Lepidoptera ~ Butterflies, Skippers, and Moths, Native Plants, Photography, Ruby-throated Hummingbird, Wildflowers, Willowdale and tagged Dropmore Scarlet, John Clayton, Lonicera sempervirens, Ruby-throated hummingbird, Snowberry Clearwing Moth on June 3, 2012 by Kim Smith.